LONG BEACH — After four successful editions of the springtime Border Run International Sailboat Race, its organizers said they “got itchy to put on another event while the sun was warm.” So, a couple of months ago, they started planning a sister race they dubbed the Border Run2. According to race founders Bob Long and Randy Reynolds, the idea was founded upon the same principles and tenets that have made the original Border Run the most attended race in Southern California: inclusion, course flexibility, various opportunities to win trophies and lots of parties. Long and his partners were also pleased to start the race from the shores of Long Beach, where there is often a good amount of breeze. With very little promotion, the organizers said, they were able to sign up 73 boats and provide a choice of four different racing courses. Smaller boats could choose to sail to Newport Beach or Dana Point, while the others could pick from two different routes to a San Diego finish. All kinds of boats participated this year, ranging from multihulls, PHRF monohulls, cruisers, dinghies and beach cats to kiteboards and a Hobie Mirage sailing kayak. On the Newport Course, Hydrogen II, sailed by John Sangmeister of Gladstone’s, set the elapsed time record. The San Diego course elapsed time record was set by Chris Slagerman’s Go Cart. And the Dana Point elapsed time winner was Elixer, a speedy PHRF boat rated at -30. 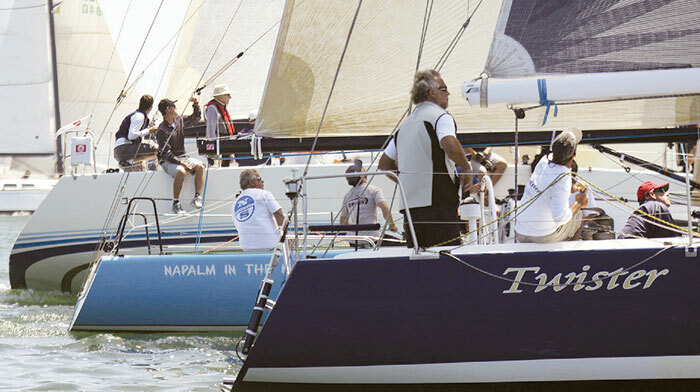 Reynolds and Long said that the inaugural edition of the Border Run2 race was something of an experiment, to see if a sailboat race could in any way compete with the holiday’s many other activities. And now, with the experience behind them, they believe that this race can be a tradition for the many racers who want to make the most of the summer weather. The 2012 Border Run2 was organized by XS Sailing.com, Shoreline Yacht Club of Long Beach (the organizing authority) and Dana Point YC; sponsored by West Marine, Gladstone’s Long Beach and Ullman Sails; and outfitted by Pirates Lair. For more race information, visit theborderrun2.org.